The appeal against the Council decision not to allow 2-4 Green Lane to become a Mosque has got the go ahead and has morphed into an Inquiry. 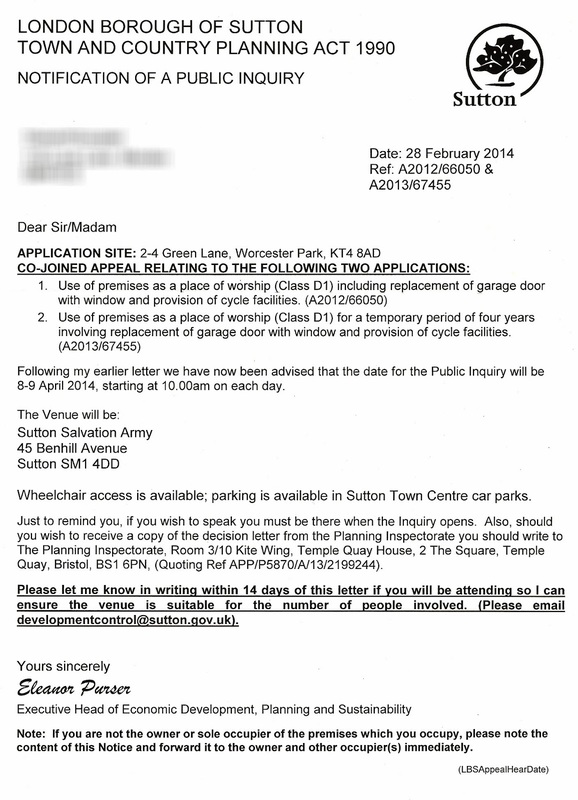 Many people will have received the letter below in this mornings post stating that the the appeal will be across two days, the 8th and 9th of April and will be held at the Salvation Army centre at 45 Benhill Road in Sutton, SM1 4DD. This is of course the combined appeal against both Sutton Council decisions to reject the application for a change of use of the building to a place of worship. The first application was submitted back in July 2012 and galvanised the community to help fight the plans due to the additional traffic and parking problems any place of formal gathering would cause at this site. The application was rejected unanimously by the Sutton Council Development Control Committee on the 3rd December 2012. The applicant then lodged a separate, slightly adjusted application and almost immediately afterwards lodged an appeal against the original rejection which was set to be heard on the 26th November last year. Once again the local community got to work gathering petition signatures and writing letters of objection to the new application. This application was also unanimously rejected by the Development Control Committee on the 25th September 2013. "If the appeal had been upheld that would be game over and work could start on the conversion to a Mosque. What appears to have happened is that PCS have been persuaded that there is sufficient grounds for the objection and have decided on a public enquiry. The dates are evidence to be presented by 11 Mar 2014 and the enquiry will be held on the 8th Apr 2014. The objectors were pushing for this as they could then use legal representation to argue their case, the council were aiming for a summary hearing." So now it is time to gear up to fight this appeal and ensure the Inquiry understands the severity of the existing traffic situation in Worcester Park and Green Lane and the soundness of the decision made by the Development Control Committee on both occasions.